Cut the Cord or Buy a Bundle? Streaming services are nudging cable television aside as single device technology is taking over the market. Early adapters of smart tech will remember the iPhone emergence; a first of its kind encapsulating phone, music and camera in one pocket sized device. Televisions have followed suit, fast forwarding past the need of dvd’s, cables and dvr. Audiences ranging from Millennials to Baby Boomers are now buying smart tv’s to bring music, video, and live television to their screens while keeping both form and function in mind. Home Technology Experts tackles a question most people are asking: What is better, cable or streaming? “Homeowners are on a mission to streamline household technology on the least amount of devices, and have every viewing option in one place. Smart tv’s own the market and continue to break the mold with options and picture quality,” states Alex Karoussos, President of HTE. New products have even tackled the issue of aesthetics, where a Sunday sports fan and a discerning interior designer may share a wall without compromise, with mounted tv’s that display fine art or mimic a mirror when not in use. Home cinema ideas begin with finding the right space in your home. Smaller rooms that are ideally set back from the ‘high traffic’ downstairs areas generally work best so that it fits in with the rhythm of everyday life. If you have a boxier room with little natural light (like this one, above, by René Dekker), this will lend itself perfectly to being a home cinema; it’s the one room where natural light is a burden instead of a benefit. Most interior designers will say that the smaller the space, the easier it is to produce effective acoustics without having to spend large amounts on sound panels, extensive surround sound systems and anti-reverberation equipment. Choosing to have carpeted floors over wooden flooring and textile wall coverings or padded wall paneling will help with this too, because they all absorb the sound instead of causing an echo. Small, low ceilings, little light – three aspects that are actually welcomed in a cinema room. Space settled, one of the key areas to look into when designing your home cinema is the electrical setup. If you aren’t working with an interior designer, it’s wise to bring in an electrician at the start of your project to consult them on how and where to fit all of your electrical appliances. Ideally, everything will be pre-wired so that they meld into the architecture of the room – this will reduce the amount of trailing wires too. In addition to your sizeable screen (whether it’s a television screen or a projector screen), you’re likely to want surround sound and various power outlets so that you’re not needing to add in electrical work post-decorating. A home cinema needs the input of experts in technical equipment and installation to be sure that it will function as it needs to. And regarding colour palettes, cinema rooms thrive when the tones you use are dark and moody. Because the light is going to be kept down low and all eyes will be on the screen, you can afford to be a bit braver with the colours you use too. It might be that this is the room that you finally try applying the same inky colour on the walls to your ceiling or you go for the heavily patterned and textured wallpaper that you were concerned might overwhelm other rooms in your home. A cinema room is a space to be daring and to experiment with your dark side. Most movie experiences don’t feature glaring lights, and neither should your own home cinema room. This really isn’t a multi-tasking space, and so it’s a rare instance where you don’t need to cater for scenario X, Y and Z, like in a kitchen where you need task-style, atmospheric and background lighting. All that will be happening in your media room is lots of film watching and relaxing. This therefore means that when considering how to light the cinema room in your house, concentrate more on ultra-soft, ambient light. Shorter table lamps keep the lighting level low so it’s not detracting from your home cinema screen. Seek out shades that throw the light downwards rather than at an angle – you might like to opt for a shade made from a heavier textile so that the light diffuses more subtly, like wool or heavy linen, or a patterned shade. It’s also wise to avoid glossy lamp stands such as chrome or polished brass as they pick up on the light and bounce it around the room – a distraction that’s not well-placed in a cinema room. Some home cinemas use LED strip lighting recessed into the skirting board or ceiling alcoves or spotlights, but both of these can feel too akin to an actual cinema. The difference here is you want it to feel like a home first and foremost, so try not to be tempted to include lighting that feels out of sync with your home’s personality. Aside from the screen, the second most important part of your home cinema setup is the seating. The best cinema-style sofa will give you all of the things that cross your mind when you’re visiting an actual cinema – enough depth to comfortably stretch out, high enough comfort for you to want to curl up and settle down for a feature length film, and plenty of room rather than being confined to one seat per person. One of the most popular cinema room settees has to be the L-shaped sofa. They give you the opportunity to fit plenty of people around the screen, or for just one or two of you to share and stretch out, like our own Meadway sofa or Eichholtz’s Colorado lounge sofa which has an extra generous chaise section that feels almost as good as being in bed. Similarly, modular corner sofas are impeccably placed for a home cinema, even in a small cinema room. Smania’s Mister P design is the dream seating solution that gives you the space, the comfort and the depth levels necessary for a rainy afternoon of back-to-back film-watching and means that you can make it as large or as small as your room allows. But if corner and L-shaped sofas aren’t for you, just be sure to pick a sofa that’s got a generous seat depth, like our aptly-named Oscar cinema sofa or Smania’s smaller Mister P sofa. An ottoman or couple of pouffes in front of any cinema room seating provides you with even more opportunity to stretch out – nobody wants lack of legroom in their own home. And comforting touches like blankets to hand and an abundance of cushions are a given. The interior design side to your home cinema room ideas is, like with any part of your house, entirely personal. But, if there’s one space where you can really afford to indulge in a dose of glamour, it’s here. There’s something about cinema rooms that have an retro, silver screen dimension to their character, so think about designing your scheme around the bygone Hollywood era. Or at least having the occasional nod to it. An Art Deco-style bar cart in the corner is an easy yet playful touch that will make your cinema experience feel more luxurious – try Ralph Lauren’s range of cocktail essentials to top it off. Upholstery in velvet (red for the ultimate depiction of Hollywood glamour) with a touch of fringing here and there, be it on a sofa’s bottom edge or a vintage lampshade is where you begin to add the decadence. Curtains were then, and are now still, commonplace in a cinema, helping with acoustic absorption, noise reduction and to block out any light creeping in. Choose velvet for a traditional take on the home cinema design or linen, nubuck suede or even supple, aged leathers for a more contemporary look. Hollywood’s Golden Age is known for its glitz and the cinemas of the 1930s were often highly ornate so don’t shy away from decorative touches like sculptures or even works of art that will help you to reference this, such as Eichholtz’s monochromatic of Old Hollywood heartthrobs like Humphrey Bogart and Sean Connery. If somebody enters your cinema room and feels just a hint of Charlie Chaplin, Marilyn Monroe or Fred Astaire, then you’ll have achieved the intended effect. We are often asked to explain the different options available when it comes to lighting control systems. Nine times out of ten, shortly after we begin the explanation, most people are already thoroughly confused. Maybe we’re not explaining it correctly, or maybe it’s just something you need to see to understand… At any rate, we were very pleased to stumble on the diagrams below from Lutron. These diagrams clearly show everything you need to know about Localized, Centralized, and Hybrid lighting control system designs. Rather than re-writing it all, we figured we’d just copy it all here for your viewing pleasure. If you're still unclear, give us a call or come visit our showroom and see it in action! Amazon Echo, powered by Alexa, now has a skill for Savant Pro. In addition to the award-winning voice control options on the Savant Pro Remote, Savant customers now have the ability to control their Savant Home through Amazon's far-field voice technology. You can now use Alexa voice control to activate a Savant Scene for single room or entire home control. In addition, you can dynamically control room lighting and a suite of entertainment services. Any Savant Pro system running Savant 8.4 or later can have Alexa voice services added to the system through the Alexa App and any Alexa-enabled device. WannaCry is a current global ransomware cyber-attack that is taking advantage of a Window’s vulnerability known as Elite Blue. Malware is short for malicious software which can be used to interfere with computer or mobile operating systems (Microsoft Windows, Mac OS X, iOS, Android, etc.) Malware can do anything from gathering sensitive (usually financial) information to holding your files ransom to just displaying annoying ads. Ransomware is a form of malware that encrypts your information and demands payment to decrypt it Ransomware can encrypt individual files, a computer’s Master File Table, or a hard drive. Hackers create malware to extort money often demanding the victims pay via Bitcoin, an online global money transaction system where identities are anonymous. Ultimately the victim decides if the hostage information is worth the ransom. Typically users have to do something to become infected. They click on a link, open a file, or connect external hardware. The WannaCry malware attack is different because it travels through the internet searching for machines that are vulnerable (Elite Blue). Although Microsoft pushed a fix for the vulnerability last month, not all users have installed the update. When the malware detects that a machine does not have the update it executes a cryptoviral extortion attack. Users then get a screen informing them of what happened demanding $300 to decrypt the files. So far WannaCry has attacked tens of thousands of computers in over 100 countries and caused a hospital in England to cancel medical procedures. Yes, the update notifications can be annoying, and they always pop up at the most inconvenient time, but they are important. Try setting your computer to automatically update on your off hours. If you are using an unsupported OS such as Windows7 or Windows XP, Home Technology Experts highly suggests you update. There are many non-malicious ways you can lose valuable files. Backing them up to the cloud is the easiest way to ensure your important documents and beloved photos are safe. If you don’t feel comfortable doing this on your own, Home Technology Experts or your IT guy can help you. There is an overwhelming notion that projectors belong in theaters and conference rooms. Since televisions are available in larger sizes at lower price points, it is easy to understand why projectors are often overlooked, but don’t count them out just yet. At Home Technology Experts, we like to consider all of our options and then choose the best solution for the project. Now and then projectors do trump televisions. When should a projector be considered? Yes, the ability to manufacture enormous televisions does exist. If you’re in the market for a 370-inch display for $1.7 million, give us a call, HTE would love to sell it to you! If not, consider a projector. Projectors allow the characters you’re watching to literally become larger than life. Especially when watching in HD or UHD, small details that often cannot be seen on televisions due to their limited size become noticeable on a larger surface. We often have clients who want to make a BIG statement with their video. While we typically use projector screens, a blank wall can be used as the projection surface. We once used a large retaining wall to create a beautiful outdoor theater. When comparing a television and projector of the same quality, the television will always have the brighter image. Even though televisions are bright, ambient light, especially sunshine, can cause the image to look faded or dull. This problem is even more noticeable with projectors. However, many homes have shades or curtains which solve the issue. If you’re not competing with ambient light, projectors can look just as good as some displays. At Home Technology Experts, we have found that clients prefer projectors in areas such as basements, recreation rooms, and man-caves. These rooms are typically found on the lower level where there is less light and are designed for socialization where a larger screen comes in handy. Shadows occur when an object comes between the projector and the screen. The best solution, use an ultra-short throw projector. Sony’s 4K HDR Home Theater Projector is installed less than a foot from the wall and can create a 100-120 inch image. Not only does it eliminate shadows, but it also creates a beautiful high contrast image with TRILIMINOS™ Color. While rarely used for residential use, rear projection is always an option. This design sets the projector behind a translucent screen. A very popular option in corporate settings or on stages since it allows for presenters to stand in front of the screen without creating shadows. A properly designed system also makes a huge difference. At Home Technology Experts, we have taken over jobs where high-end homes have projectors sitting on half walls, or in cabinets instead of being mounted to the ceiling. Standard projectors must be set back a distance to fill the screen. The lower the projector, the greater chance of shadows. There are applications when a properly mounted projector reduces the occurrence of shadows so much that it is no longer an issue. It’s true back in the early days of single-chip DLP projectors you could “see the rainbow” but times have changed. Let’s be clear if you want the sharpest most dynamic image on the market, a projector isn’t for you, but HTE does have an array of OLED and QLED displays for you to pick from. However, if you are just looking for a crisp vibrant image that looks great, you might want to think about a projector. As big screen TVs began dropping in price, the projector world took notice and stepped up their game. An off-brand LCD or LED projector isn’t going to give you a great image. But a quality DLP or laser projector will produce brilliant video. If you are buying a High Definition (4k) or Ultra High Def (8k) projector, it is going to produce a stunning image. The video will look sharp with vibrant colors. When LCD TVs first hit the market, sports fans hated them! The displays had a low refresh rate so even when you put them in “Sports Mode,” when images went speeding across the screen they would get blurry or leave artifacts. The same was true with projectors at the time; you would walk into a sports bar, see a wall with huge video of your favorite game, only for it to get blurry when the action got good. Just like the refresh rates increased in LCD TVs as they evolved, eliminating the issue, the same happened with projectors. Any source (cable box, TiVo, Kaleidescape, Apple TV, Roku, etc.) you can connect to a television can also be connected to a projector. Now and then our system designers are asked if there is such thing as a smart projector, the answer is yes, but why would you need one? Since we can connect any video source to the projector, your TiVo, streaming device or even your computer gives you all the capability of a smart projector. If you have a Savant system, you can even add Savant Tiling. With multiple sources on a single screen, the extra real-estate gained by using a projector is greatly noticed. This Earth Day we at Home Technology Experts are looking at how automation and other home devices can help reduce electricity, saving you money and helping the environment. People are often shocked to learn that cable boxes rented from Verizon and Optimum are serious energy hogs. According to the Natural Resources Defense Council (NDRC) Americans are spending $2 billion in energy costs to power set top boxes that are sitting idle. These “power vampires” as NBC called them use as much energy when they are not in use as they do when active, that’s as much energy as your washing machine uses to clean your clothes. Now think about how many cable boxes you have. A three-bedroom apartment can easily have five cable boxes. Come out to the Hamptons with guest rooms, pool houses, and outdoor televisions and see the energy (and money) trickle away. TiVo’s all in one distributed video system allows for a single top box to serve as a cable box/DVR, streaming device (such as Apple TV or Roku), and Sling Box for up to five TiVo Minis. The TiVo Minis consume significantly less electricity and because they don’t need to be in standby mode when not in use they can truly be turned off. By serving as streaming media players you save on both the purchasing cost and additional energy costs associated with extra devices. Lighting control systems reduce energy usage through scheduling, dimming, and sensors. Dimming LEDs saves electricity, creates ambiance, and even extends the bulb’s life. According to Lutron, the average person cannot tell the difference between a light at 100% versus one dimmed to 80%. The savings quickly add up when using dimmers throughout your home. Sensors can be used to take dimming a step further. Day light sensors measure the ambient sunlight in a room and adjusts artificial light’s output accordingly. On sunny days, the Day Light Sensors automatically dim the lights and may even turn them off if the room is adequately lit by sunshine. The less energy needed to power a fixture to reach a desired brightness the greater the savings. While any LED consumes less energy than an incandescent bulb, not all LEDs are the same. Prominent companies in the industry such as Lutron will tout numerous energy and environmental benefits such as limited UV admissions, energy star ratings, and more. Low lighting fixtures are made for both indoor and outdoor applications. At Home Technology Experts we offer a variety of low voltage options that are popular in home theaters. Our exterior illumination division, Hamptons Landscape Lighting, exclusively uses low voltage fixture in all of their designs. Motorized shades are not only a convenience, but they can help cut down on your heating and cooling costs. Via programming shades automatically rise in the winter to allow the warmth of the sun in, or lowered during summer months to keep the heat out. Especially in the Hamptons, heating and cooling a home can be a big expense. Wireless thermostats can help. Many large homes have HVAC zones, using wireless thermostats and home automation software entire zones can be turned off when not in use. Additionally wireless thermostats can be programmed so it automatically adjusts to your life style, saving on gas and electricity when you’re not home. At Home Technology Experts we have learned that a black screen hanging on a wall can be the bane of a designer’s existence. Until now options have been limited to hiding displays using TV Lifts and Media Décor, or purchasing a mirror television. Fuseproject is introducing a new solution that HTE is excited to offer. The studio created a Samsung television concealment that is identical to framed artwork. When the television isn’t playing content, it goes into artwork mode as opposed to displaying a black screen. Homeowners can select from a variety of artists and genres, or they can choose to display custom work or photos. The television uses sensors to adjust the artwork’s brightness, so it gives the appearance of physical art as opposed to a digital image. Available in two sizes: 55" and 65"
As per Samsung, pricing will be announced at the end of April and shipping begins in June. sign up below to Receive updates. Headquartered in Southampton, at Home Technology Experts we have been designing and installing luxury outdoor systems since our inception. Our system designers are sometimes asked if outdoor products are necessary. These solutions are more expensive than their interior counterparts, and it is understandable that prospective clients want to understand why. Below are the four reasons to use products designed for exterior use. The most important reason is for the safety of your family and property. Using products designed for interior use outdoors can be dangerous. Interior products are not held to the same safety ratings. If water gets into the casing of a powered electronic, it can become a fire hazard. Outdoor products meet building code requirements for external use. Waterproof is not weatherproof. Many of our manufacturers make both waterproof and weatherproof products. Waterproof means it can withstand water from a nozzle in any direction hitting the device without causing damage. These products usually have an IP65- IP67 rating. Weatherproof products often have an IP68 or IP69 rating meaning that it can handle high-pressure water (rain/wind mix), extreme temperatures and can prevent dirt, sand, and dust from entering the unit. Weatherproof products can withstand the extreme temperatures, storms, and pollen in the Hamptons that waterproof products cannot. Many products are used differently in exterior systems, and thus the outdoor versions are designed differently. Think about outdoor speakers. Typically, speakers are found in the wall or ceiling throughout a home, so audio is coming from above. While HTE does offer surface mount outdoor speakers for covered patios, this solution is not an option for certain applications. 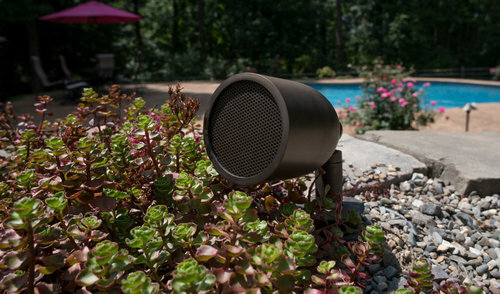 Landscape speakers are designed to project audio upwards while blending into the foliage. Televisions are rarely placed in front of an open window or directly under a skylight. If done as a last resort our system designers heavily advise blackout shades to prevent the sun’s rays from interfering with the perceived picture. 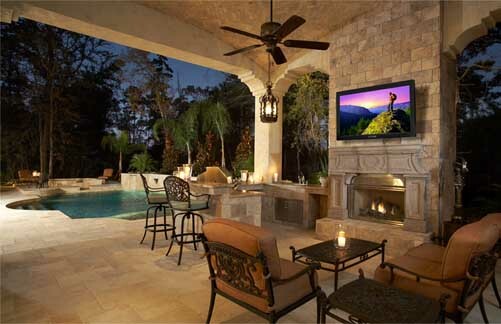 In our article, Do I Really Need an Outdoor TV, we discuss the fact that outdoor televisions are designed to be incredibly bright to compensate for sunlight. The screens on outdoor displays are also coated to prevent glare and fog. Not using a product as recommended, voids the warranty. Outdoor electronics are more expensive but typically have impressive warranties. Many of our exterior audio and lighting manufacturers offer lifetime warranties. Click on the product groups below to view the manufacturers tested and selected by our engineers. Don’t want technology to be your yard’s focal point? Read our article on Designing to Disguise Outdoors. With the proliferation of connected devices, home networks have become a necessity. Over 275 million Americans have the internet in their home, yet many users have a limited understanding of how it works. 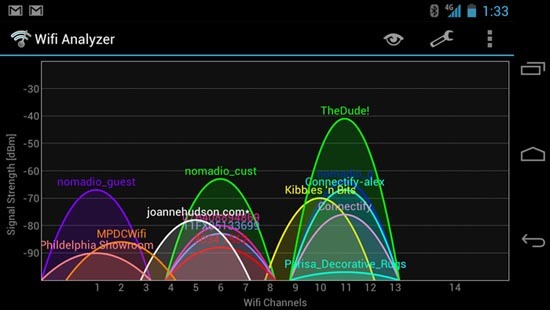 Internet Service Providers (ISP) such as Fios and Comcast send a signal via a cable into your home where it connects to your modem. ISPs understand that when it comes to the internet, there is no one size fits all solution, so their options range in bandwidth and speed. Speed describes the number of bytes per second traveling between the internet and your computer or device. Bandwidth describes the capacity for speed. Think of bandwidth as a pipe and speed as water. Water can trickle through pipes, or it can gush. However, you can never get more water out of your faucet than your pipes can hold. The signal from the modem is sent to a router allowing both wired and wireless (Wi-Fi) connections which is how computers and devices gain internet access. Home technology systems are a series of computerized devices that communicate via the internet. If the internet is down or not performing correctly, it will negatively impact your home automation. Ensuring that you have the proper bandwidth and are receiving the speed, you pay for is important when evaluating your home network. Home Technology Experts was an early adopter of residential IP control systems and one of the first Control4 integrators in the world. Over a decade working with these systems has repeatedly proved that a sub-par internet connection can bring down a perfectly engineered automation system. When streaming video or audio, data is preloaded to a reserved area of memory (the buffer) before playing. This allows for continuous streaming. Slow internet speeds will cause the video to catch up with the preloaded data causing interruptions as the new data loads. If you are watching a homemade YouTube video, poor video quality may be a production issue and not a reflection of your network. However, if you notice poor video quality when streaming from a source such at Netflix, TiVo, or Kaleidescape, there is an issue. A poor internet signal can result in blurry, pixilated, or choppy images. Remember many sources are now streaming 4k if you have a UHD television your streamed content should look like ultra-high-definition video. At Home Technology Experts we hardwire every product with an Ethernet connection. 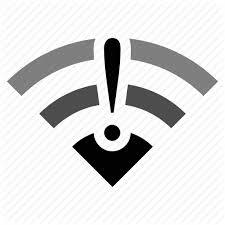 We then use top of the line equipment to create a secure and reliable Wi-Fi network. In fact, the equipment we use even adjusts to avoid interference from your neighbors’ Wi-Fi signals, an important feature in Manhattan. Our clients are not working off a plug and play ISP router/modem combo. There should never be an unreliable connection. If the internet is skipping out, there is a problem. The technology used in our designs allows for overlapping wireless signals. Basic consumer equipment requires you to disconnect from one wireless booster before connecting to another. By contrast, our equipment allows for overlapping booster ranges, automatically connecting to the strongest signal. As a result roaming or dead zones should never be a problem. If there is suddenly a connection problem in a specific area of your home, this indicates a larger issue. Technology is constantly advancing, the best way to avoid problems with your internet is to verify your network is equipped to handle your needs. Below are a few things we check when clients experience internet issues. HTE will first verify that you’ve chosen an ISP package that can support your online needs. Next, we check that you are receiving the speed you are paying for. By looking for issues such as packet loss and latency we can determine if your network is experiencing congestion. There are homes where the demand on the Wi-Fi have doubled or tripled in the past five years. In situations like this, simply upgrading one or two pieces of equipment will make all the difference. Google Home is a smart speaker similar to Amazon Echo. While Echo is powered by Amazon’s proprietary software and trigger word “Alexa”, Google Home’s software Google Assistant, is often referred to by its trigger phrase “Ok Google”. The main component of both devices is their software. In this category, we looked at how well the software performs basic built-in functions and excluded additional apps or skills which have to be installed. Both speakers require signing into an accompanying account during setup. Google offers free accounts while Echo (Alexa) must be linked with an Amazon Prime account for $99 a year. It’s important to remember that while smart speakers are relatively new both Ok Google and Alexa have been staples on Droid and Fire products for years constantly learning and evolving. Both accounts used for this comparison have previously been used on other devices. When it came to answering questions there was no comparing the two with Google being far superior. Both could give the weather forecast, recite news headlines, tell jokes, and reply with witty answers to philosophical questions, but we were testing for practical applications. It comes as no surprise that since Google Assistant can access the vast knowledge of Google’s search engine (which has been cultivating information since 1996) it can answer more questions than Alexa. Alexa can give basic information such as who is the president, where Boston is, and how many ounces are in a cup. However, its knowledge is very limited and always fails to answer specific questions about broad topics. Google Assistant searches the entire internet for an answer and will cite the source. If it is not a basic knowing question, the response will begin with “According to (insert website or publication source)” and will proceed to provide the answer. We then installed the Wikipedia skill in the Alexa app and asked the question again. Even using the Wikipedia skill, Alexa struggled to answer questions that Ok Google could answer citing Wikipedia as the source. Since Alexa struggled to answer knowledge questions, we tested voice recognition using basic commands such as turning lights on and off, dimming, and playing different music sources in different rooms. While Alexa does a good job of understanding, she wasn’t perfect. During the test, Google Assistant did not falter. Compatible devices and services increase the smart speakers’ versatility. Amazon had a year’s head start on Google and they used that time wisely. There is no question that Amazon by far has more integration than Google. While both are constantly expanding their partner lists, Google has a lot of catching up to do. As of February 2017, Amazon Echo has official skills (integration) for Lutron and Control 4. Google Home has a driver for Control 4 which must be installed by a Custom Integrator. UPDATE: As of April 2017, Google Home has a Lutron integration. This was a close one and the deciding factor really depends on how you want to use the smart speaker. If you plan on using it to play music, go with Google Home since it produces higher quality audio. Amazon Echo is a bit sleeker with a tall and slender design, whereas the Google Home is a bit wider and shorter. If you’re purchasing the device for voice control, Echo is the better choice. Amazon also sells the Echo Dot, a significantly smaller version of the original Echo, which is the perfect option for users who want the functionality of Alexa in a low profile device. Since the majority of our clients have high-end speakers and use these devices as a means for voice control, we selected Amazon as the winner based on the Echo Dot’s discreet form. Since we are high-end custom integrator we are going on the assumption that our clients are interested in smart speakers not to play music, but to control their automation systems. For Lutron control, the choice is clear, they should go with the Echo. If a client wants to use the smart speaker for Control 4 command we then have to decide which is the right fitfor them. If they have an accent or children in the house, they may want to consider going with Google since it is better at recognizing commands. We also ask the client if they plan on using the smart speaker as an assistant. If not, we would recommend they go Echo Dots allowing for inconspicuous multi-room control. If they do plan on asking the smart speaker questions Google Home would be the best fit. As expected artificial intelligence was the star of CES. While there were physical robots on the show floor the most practical applications were with virtual assistants and connected cars. Of course televisions were on display, it wouldn’t be CES if it wasn’t. Products on display ranged from as a robotic lawnmower to Wi-Fi connected hairbrush. Alexa, the voice recognition software that comes standard on Amazon’s tech products showed up in Ford cars this week. This surprising move expands Alexa’s profile positioning the assistant to be on par with rivals Google Assistant and Siri. Amazon Echo, the device that made Alexa a house hold name introduced a slew of new partners and accompanying skills. The list includes both LG and Whirlpool appliances to Dish Hopper DVR. Other manufacturers such as Klipsch includes a built in speaker with a spot for an Alexa dot on top. We were really excited to see what Google Home was going to reveal especially since it has so much catching up to do. While they did announce a few partners we were really expecting much more. In fairness Google Home is still in its infant stages and further along than Amazon Echo was this time last year. This year CES was filled with a ton of Electric self-driving cars. While we're not sure if automakers see electric cars as the future or as the only way to show off their vehicle in a convention center (you can't run fuel vehicles indoors because of CO2) it is clear that the race for the best smart car is on and everybody from Google to AT&T is in it. Since there were so many types of smart cars we broke them out by category. Ford announced they will have a fully electric SUV hit the market in 2020; until now the largest fully electric vehicle was a crossover. They also announced that they're working on Mustang and pickup hybrids. Chrysler did one better unveiling the Portal which is the world's first fully electric minivan. Nissan and BMW showed off Microsoft's Cortana virtual assistant in their new cars while Chrysler teamed up with Google creating a new Android based infotainment system. The new format allows the carmaker to keep it's essential applications while adding Google features such as Maps and Google Assistant as well as third party Android apps such as Spotify and Pandora. Google Home (powered by Google Assistant) teamed up with Hyundai. Now drivers can simply tell the start speaker to autostart their car. Meanwhile, Ford opted to integrate Alexa. Toyota introduced "Yui" the virtual assistant they want you to think of as a person in their Concept-i self-driving vehicle. He even greats you when you touch the handle on the car door. The BMW, Intel and Mobileye team went the traditional route, allowing drivers to be impressed by the technology instead of bonding with it. They hope to have their self-driving car on the road by the end of 2017. Nvidia debuted its self-driving car, BB8 (yes, that's a Starwars nod). They are working with Audi and hope to have their collaboration on the road by 2020. Hyundai introduced Ioniq, another self-driving car, at a price point much lower than their competitors, but what has everybody talking is their "Mobility Vision" concept. Their vision is to blur the line between car and smart home, having the vehicle attach as part of the home via a portal essentially turning the car into additional home seating. While not at CES, Tesla is still the one to beat, as evident when Chinese start up Faraday showed video of their car racing the Model S and Model X. In a world where everybody wants to be connected, nobody wants to be tethered by a cord. So it makes perfect sense why so many companies at CES were talking about wireless charging. Dell unveiled their new convertible two-in-one, the Latitude 7285, which can be charged via a wireless charging pad. Although not physically connected, the laptop must rest on the charging pad, rending it immobile. Ford announced that they are testing wireless charging for electric cars, but the details were limited. The most exciting announcement was from Energous who revealed a system that allows mobile devices to remain mobile while charging. The current technology in wireless charging pads uses magnetic induction which severely limits the charging range. By contrast, Energous's WattUp uses radio waves, allowing for a further charging distance. The system works by attaching a small portable receiver to the device, users can then move up to 15 feet away while simultaneously charging. Samsung introduced a new TV technology QLED that uses a refined metal quantum dot material. This results in a larger color gamut, claims of blacker blacks, and most importantly color saturation regardless of brightness. Typically color gets blown out when the brightness is enhanced, thus appearing white. Seventeen years ago BlackBerry took the business world by storm, but the past few years has been rocky for the brand to say the least who turned over production of their phones to an overseas partner in September. In 2017 the BlackBerry is back along with its signature keyboard. The new BlackBerry phone, Mercury, runs Android 7.0 but comes with the traditional BlackBerry apps. The smart phone will also recognize gestures on the keyboard and the space bar doubles as a fingerprint reader. The phone will have a front and back camera as well as two physical buttons on the side. Additional specifications, along with cost and release date are unknown. Furthere details are expected to be announced next month.